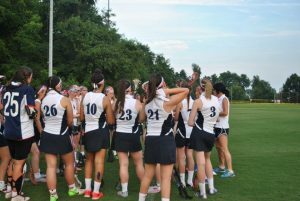 2018 Itinerary and new video posted on metrogirlslacrosse.org in prep for the tour. Six days and counting for the 2018 tour! The only way to describe our first game of the tour was WET. As the team arrived, the rain was already falling but the girls were not put off by the weather. With a general feeling of excitement amongst the team they warmed up to shake off those first minute nerves and focus ready for the game. With the Captains Ella and Anna leading by expample and motivating the team the coaches could tell from the pre-game team talk, the team was fired up and ready. After the national anthem, the Metros clustered together for a final shout before getting out onto the field for the first draw. Both teams started strong with even possessionn although the BUCS team took advantage of their opportunities in from of the goal scoring three times. 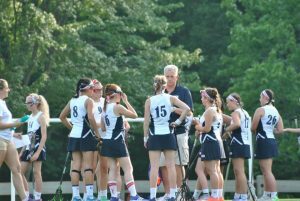 MetroGirls called a timeout after which the English girls really settled into their rhythm. Great work off the centre draw by Harley Tideswell meant the Metros scored their first goal with an amazing finish by Molly Preston. Annabel Noble and Millie Hurt created plenty of opportunities in the rest of the first half with two more goals resulting. Defensive work by Sadie Cox and Lucy Mayer and Ella Langston helped by the midfielders and organised by Ruby Conroy held out the opposition until the half time. The first half ended 5-3 to the BUCS. The second half started with our defensive team including Ettie Leonard, Rachel Edwards, Monique Conlan and Ella Langston working really well together causing turnovers, defensive transition runs by Monique and Lily Lloyd as well as a stylish goal from Katie Hewetson followed by another great period of off ball attacking work by Phoebe Hurt, Lucy Bowden and Amy Smith helped the Metros to bring back the score line until we were drawing 6-6 shortly after half time! Abi Hughes had a couple of awesome saves with clears deep into the midfield with transition passing giving the MetroGirls a huge position advantage. 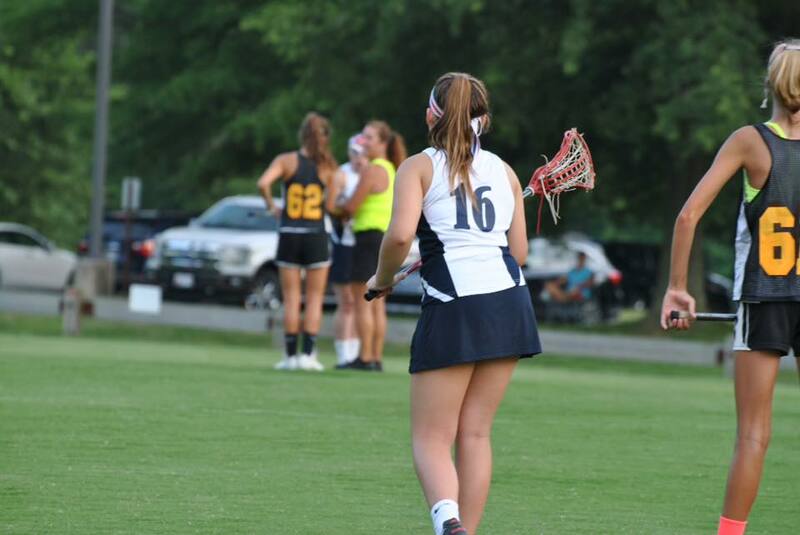 Harley Tideswell and Phoebe Fisher both scored awesome goals to keep Metros in the game. With five minutes to go, the MetroGirls were two goals down. Space was created in the fam for Phoebe Hurt to score and with a final few substitutions and one minute to go Ella Dimbylow scored to bring us even! The bench was going crazy and the girls on the field cheering so much with the clock stopped at 30 seconds. The supporters in the stands were chanting for the MetroGirls and the BUCS team substituted on their tallest players for the draw for the final time. those girls couldn’t stop us and Metros took possession with another drive to gaol and Millie Hurt scored again to make a hat trick and take us into the lead!!! Metros played intelligently for the remaining 15 seconds holding onto the ball and keeping it safe until the final whistle was called. Despite the rain and all the players, coaches and supporters being soaked through – we were all delighted with a win for our first game especially with such a nail biting ending! Congratulations to everyone playing and than you to BUCS for such a great game! Although we are hoping for better weathere for the next time! 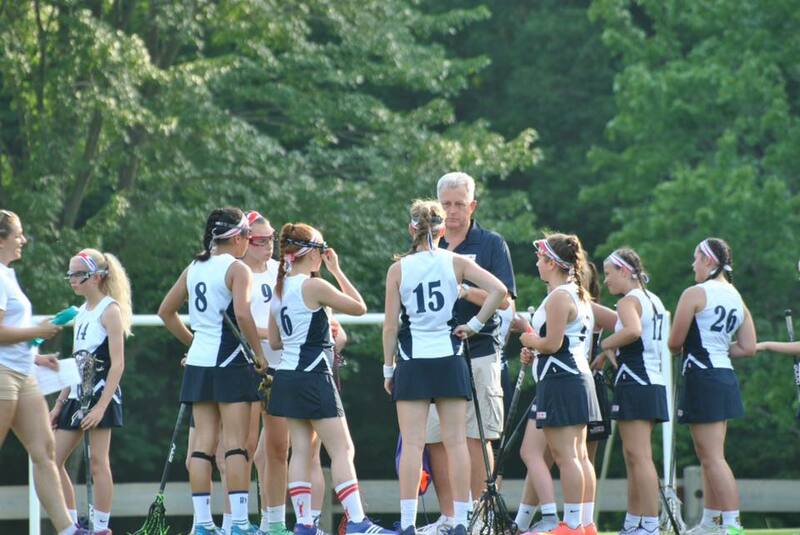 Thursday 19 11:00 AM Tour Adult Leaders ride bus to Philadelphia meet at Annapolis Sports Complex. 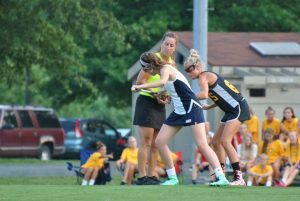 Last nights game against St Mary’s was always going to be tough, and seeing the team we were playing with a high number of current Anne Arundel girls as well as recent alumni immediately put the pressure on the Metro team. Coach Carina took charge of the warm up and got the girls ready for another big game. Metro girls once against lost the ball on the draw and after a long play and solid defending from Emma Cooke, supported with excellent slides from Millie and Lucie eventuially the St Mary’s team scored a goal. The Metro Girls were not prepared to have another goal against them and pulled away a lead with goals from Chloe, Em Richardson, Emily Kynaston and Maisie. A yellow card late in the second half and the defence feeling tired with one man down meant the opposition scored 4 goals in quick succession. A disappointing end to a great first half, the St Mary’s team took the lead. Half time was quiet and subdued compared to the usual upbeat and chatty team we were used to. Eventually the girls lifted their heads and started to believe they had it in them to win a second game. Emily Kynaston scored the first goal of the second half. Ellie Simpson had an awesome game outrunning the St Mary’s girls on more than one occasion to get the ball safely into attack. Emily Richardson really used her strength in her power shots to score twice more. That’s a hatrick! Beth really showed some flair, defending hard when the American team tried to fight back and Aimee saved an amazing 13 goals in the game to prevent any St Mary’s goals. Ellie B scored, quickly followed by Dakota. Eva came back on and created space for Amy to score a goal with only a few minutes to go. We were also very glad to welcome our captain Alex back onto the pitch who did a great job assisting the last goal of the game with a quick sprint in transition, pass to Katie who scored on her first shot of the tour. That’s another WIN for the Metro Girls against a very competitive team. Well done to all girls playing and raising their level beyond what we have seen from them so far. We’re all looking forward to Hershey park on Monday and the friendship game on Tuesday! 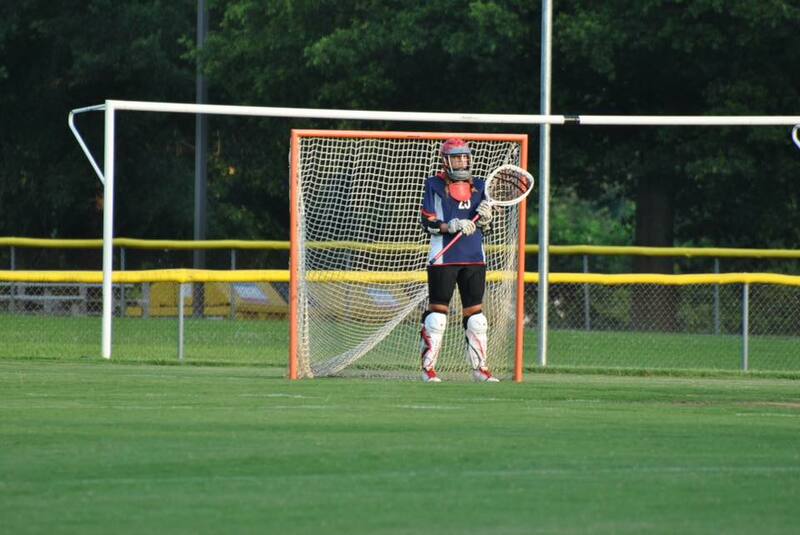 Wednesday’s game hosted by Davidsonville Gators had the best start for the Metro Girls of all the games so far. Straight from the whistle the girls were fighting and ready to give 100% to this match and it showed when Em Richardson scored the first goal! The girls didn’t let it slip with Emily Rossiter playing solid defence and not letting any of the Gators through causing a turnover and a goal scored by Chloe Dodd. The team really pulled together with more goals from Miranda, Maisie, Ellie B and a second goal from both Chloe and Em Richardson. Besides the goal scorers both Katie and Joni were working hard off ball creating space for the drive and re-defending to success when the ball turned over. Half time was in high spirits as we had a good lead on the opposition (7-1). Girls were determined to maintain the level of play and went back onto the pitch fighting. 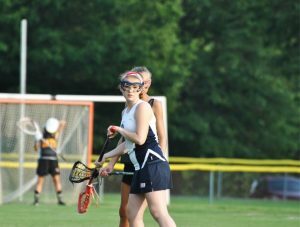 Unfortunately Davidsonville also came out fighting and their goalie was having a great game coming out of the goal for interceptions. The Gators scored two in a row. Metros responded with Aoife having another great game taking 4 shots and scoring twice. 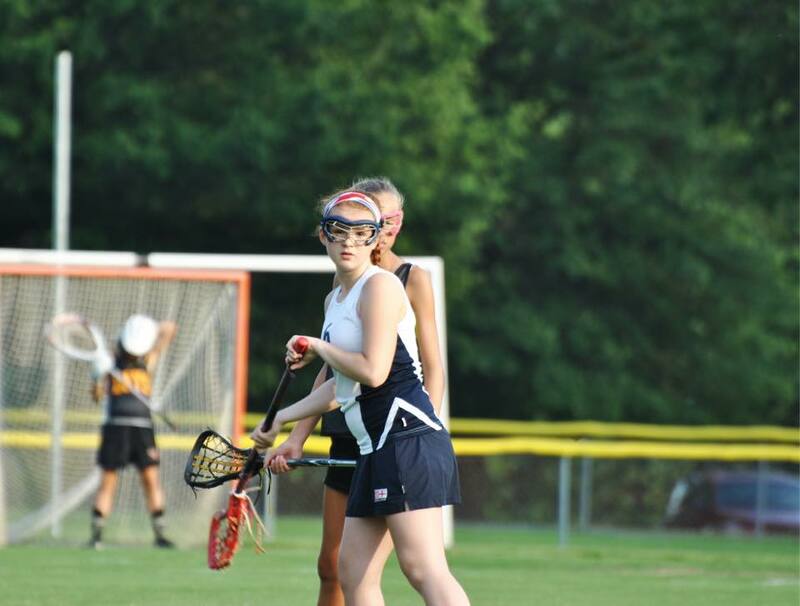 Emily Noble stepped up her game pushing out hard on the attack players. Miranda and Ellie B both scored one more goal each to secure our first WIN of the tour! 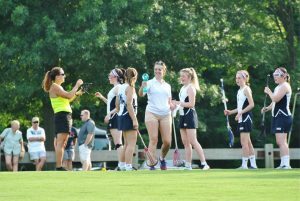 Besides the girls mentioned, every single member of the team played exceptionally well and brought their best to the game. While many of the attack and midfield players are aiming for hatricks every game, none were scored today – feeling positive about the next game. Well done to all the Metro Girls. Yesterday was the day trip to Washington DC. An early start for everyone but this meant we were in the city by 8.30am ready to walk around the city. We were all glad to be there so early to miss the crowds allowing us to get some good photo opportunities and besides that the heat! First stop was a walk around the outside of the White House, besides an angry security officer only letting half the girls cross the road at a time the visit went very smoothly and all the girls enjoyed taking pictures before getting back on the bus (thank goodness for air conditioning!!) and heading for the next site. By the time the girls were off the bus the temperature had really risen. We took the time to visit the World War II memorial (the water feature looked very inviting to the girls and the coaches) and then a leisurely stroll through the park to the beautiful Vietnam war memorial. 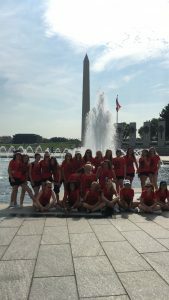 We finally visited the Lincoln memorial after a quick stop to grab an ice cream and cold drink the team was in high spirits climbing the steps to get inside. A quick visit to the gift shop and we hopped back on the bus for lunch and to head to the museum of native Americans. We had a couple of hours to learn about the history of the Inca trail and watched a performance of traditional drumming and singing. The final stop on our DC tour was to the Jefferson monument. 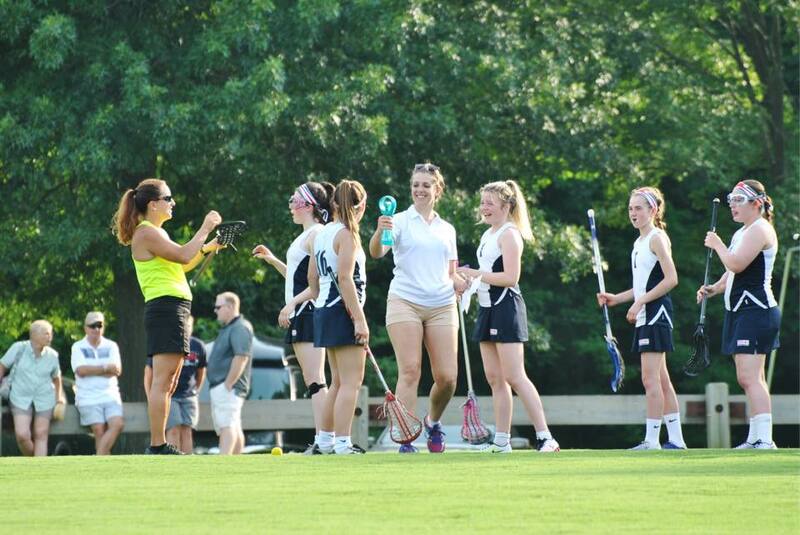 Coach Tony introduced a photography competition to be judged by be Anne Arundel coach Kelly. There were many entries and the decision was tough but the final winner was Emily Richardsons photo featuring Millie, Lucie and Beth. 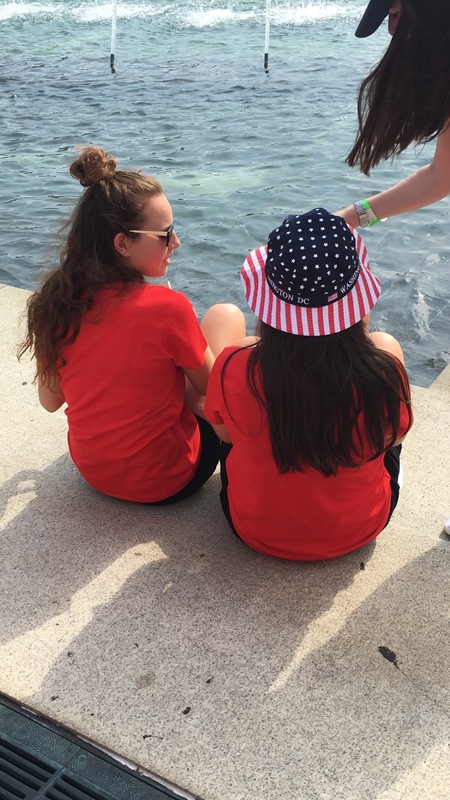 Chloe with her Stars and Stripes bucket hat. 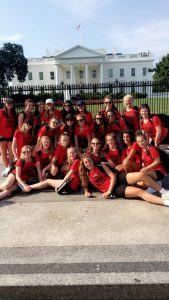 Metro girls posing in front of the White House. 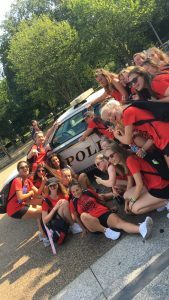 After Saturday’s tough match in the heat against Bucs the Metro Girls have reached international fame with an article published on the front page of the local paper! Today’s game came after a couple of days off, where the girls got to enjoy host activities such as tubing, hot tubs, trips to Georgetown and the local favourite, crabs. There was lots to catch up on before the game but this didn’t stop us preparing for a strong start against another fearless American side. The first draw went our way and the Metro girls were positive but sadly a few mistakes led to an early goal by Crofton. Miranda brought it back level with a goal but the Metro girls couldn’t hold off the Crofton girls who pulled away with a lead. Emily Kynaston went into centre with great draw control creating a scoring opportunity from Dakota. By the end of the first half the Metro defence was tired and heads were down with the score 10-2. Second half started off slowly again for the Metro girls but another goal from Miranda based on great defence team work and sliding between Millie and Lucie and then Jaime transitioning up the field got the girls back in the game. No one can deny the defence played outstandingly second half, Emily Noble, Emily Rossiter and Emma Cooke in particular making great contact and preventing shots with Aimee only allowing 2 goals in this half. Aoife has to be mentioned for her fantastic ground balls and five consecutive pitch sprints which allowed Dakota to assist a second goal to Chloe. Overall a great second half which really showed grit and determination from our girls. 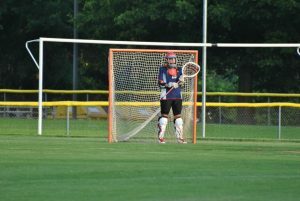 Our goalie Aimee makes 18 saves this game! 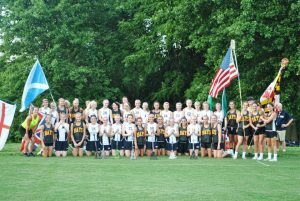 A selection of photos from the Bay’s game (the first game for the girls). Photo credit to Gabby Donner. What a game! 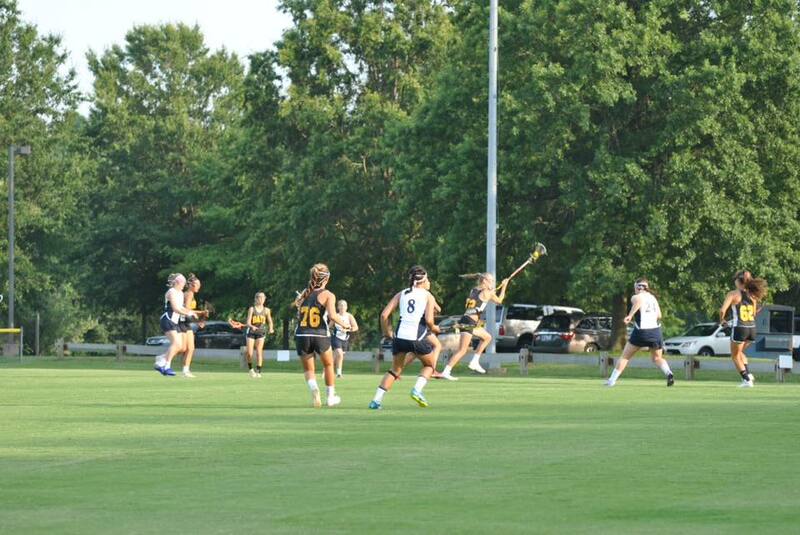 Today’s game played on a beautiful turf in what felt like 115F for the girls against the Bucs in Pasadena. The Americans started off with a quick goal but the Metro Girls brought it back with two in succession with beautiful play and a great couple of goals from Miranda. The defence held strong with Sophie producing a perfect crease drive stop and the centre draws all to play for. A very competitive start to the game! An unlucky yellow card left the metro girls one player down just before the second half where the score was level. 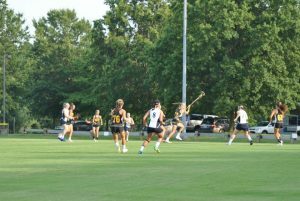 All the girls played extremely well at this point to keep the score down but the heat of the first half took its toll in the last minute ending the first half 8-5. 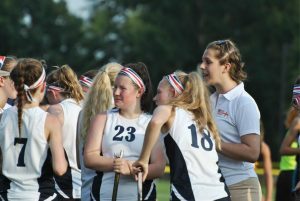 Half time pep talks were up-beat and the girls were determined to go out again and play even harder as the temperature of the pitch was rising into the heat of the day. We all believed they could do it! Bucs came out hard for the second half with 4 consecutive goals extending their lead but this didn’t stop the metro girls. Em Richardson took charge receiving the draw after playing outstandingly all game and charging down the pitch from the centre draw to score a goal. And the metros heads were back in the game. Great defending from Mary helping the ball transition to the attack for Eva’s first goal. The final score was no reflection on how hard the girls worked and the entire coaching team was very proud of their performance and team work in difficult conditions. Other successful shots on goal from Maisie (1), Dakota (1) and Ellie B (1). Another incredible 10 saves from goalie Aimee and congratulations Chloe for a hatrick and all round great game. Big thanks to Bucs for hosting us at such a fantastic pitch, to the girls and the parents for staying out in the heat and particularly to Huggy moms Kath, Anita and Michelle working hard all game filling waters, preparing ice towels and cooling the girls down on such a hot day. Monday’s match will be another challenge for the team but hopefully all will be excited and ready for the game after a couple of days off to enjoy the plans made by host families. Today’s game hosted by the Bay’s was certainly a challenging first game. The girls met at 5.30 still in over 30 degree heat and a high humidity. The girls did an easy warm up and a fantastic rendition of God Save the Queen before hitting the pitch ready to fight. 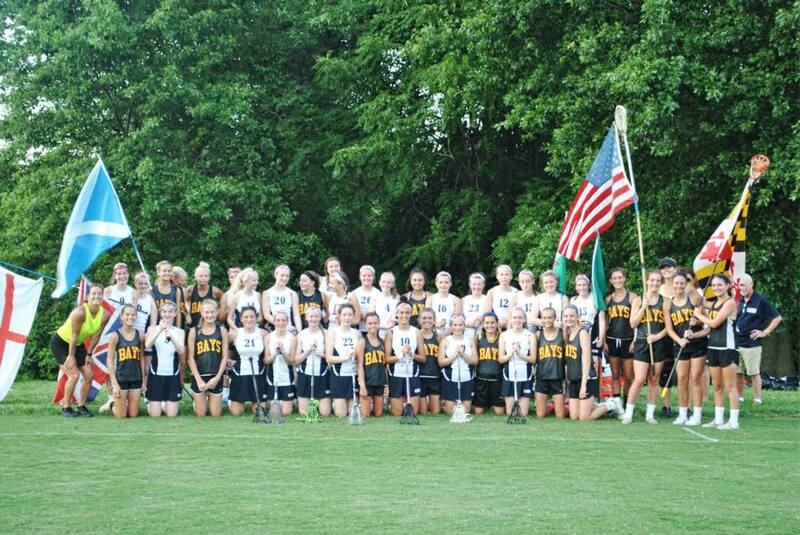 The American team scored the first goal straight from the draw but that didn’t stop the metro girls. Solid defending by the girls with Lucy and Miranda both turning over the ball to prevent anther goal for a few minutes. The ground was soft and with everyone working hard, captain Alex took a tumble. The girls brought their determination and team work once again ending the first half hot and tired 6-0. Second half was really when the girls got into their stride with two goals in a row from Ellie Bridge in the centre. Jamie was determined not to leave the pitch without giving bruises to several of the girls and Chloe Dodd ended the game with a goal after a few more shots from both her and Ellie B. And we can’t forget to mention our goalie Aimee Rogerson who managed an incredible 18 saves throughout the game against a very tough opposition in tougher conditions. Congratulations to all girls who worked their hardest and a big thanks to the Bay’s team, coaches and referees for the pitch and an excellent game and reception. Next game is tomorrow lunchtime, bring it on! We all arrived safe and sound yesterday with only minor hiccups along the way. After being sat on the plane for an hour before taxi we finally took off. It was only half an hour before the girls were star struck, ROBIN HOOD WAS ON THE PLANE. Good work to Em Richardson for plucking up the courage to ask if it really was him. Several selfies later (with Robin Hood sleeping in the background) and a final photo with the man himself, we all landed and met the coaching team from the states. Another couple of hours on the coach fuelled by Cheetos and fruit snacks and the girls finally got the chance to meet their host families. There were banners and cheering and a confetti canon! What a welcome to Annapolis!! For the first full day of the tour the girls had a training session with all the tour leaders and girls to catch up. 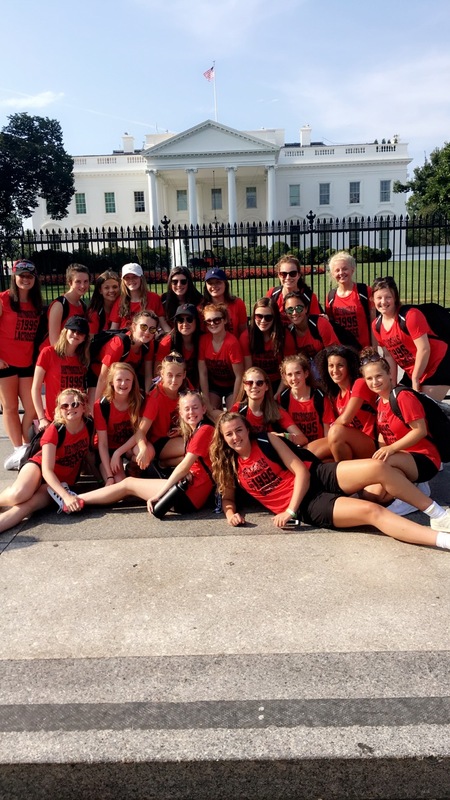 Everyone was in high spirits and after a short but very hot training both teams exchanged gifts before heading off to lax world to shop and eat pizza. Hopefully they will all be well rested and ready for the first game tomorrow evening!